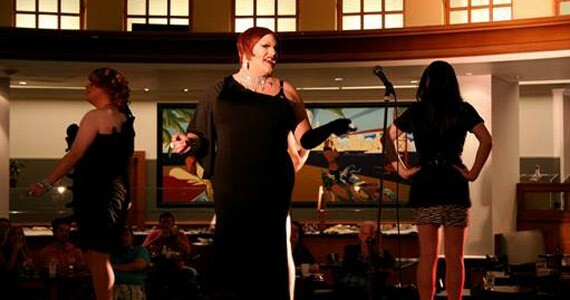 The casino crowd can't get enough of Halifax's famed drag performer. Ms. Fatale centre stage, where she belongs. It seems the Casino just couldn't get enough Rouge, and can you blame them? Perhaps in efforts to make summer last longer the Casino's Paradise Buffet decided after what was supposed to be Ms. Fatale's last show for the season, to extend the weekly event for seven more weeks. Let's be honest, this is kind the kind of glamour that should be happening at a casino. Fellow fine ladies Kristi Davidson, Elle Noir and Kimberly Diamondz help to light up the stage with games, impersonations, choreography and music. Whether for a lesson in hair, makeup and over-the-top fashion or for gut-busting laughs, this time don't miss the Casino's finest showgirl.